Updated with even more Bingo / Matching Boards! 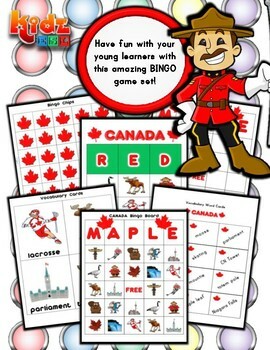 Here is a set of Bingo / Matching vocabulary boards with a Canada Theme. There are 12 vocabulary items to identify plus 50 game boards, 2 template boards, and 12 vocabulary (picture / word) flashcards. This makes a fun and educational vocabulary game that can be used in many ways. 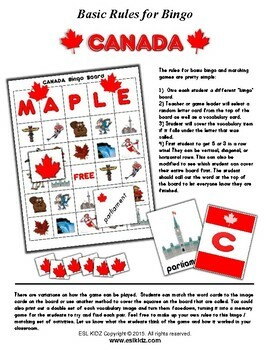 It can be used to match pictures and words or as a traditional 'Bingo' game. There are two sets of boards: a set of 3x3 ( 9 vocabulary items ) boards for lower level students and a set of 5x5 ( 12 vocabulary items ) for more advanced. 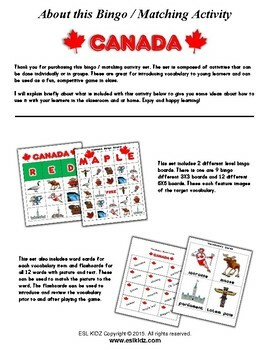 If your looking for even more activities with a Canada theme and want to save big, check out my Canada bundle by clicking on the link below. 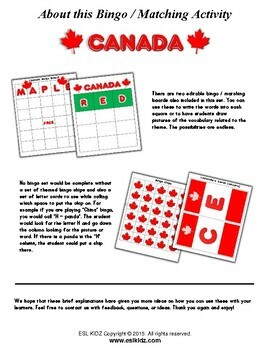 This is a great deal and includes this activity pack as well as practice for vocabulary and numbers. We have many more themed activity sets for sale in our store. You can click on the links below to see more of them. Be sure to check out our bundles as well to save.